Here at recycle crafts we have some new ideas to help you to save some money and do your bit to keep our planet green and healthy. 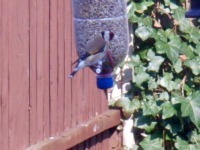 This time of year it's a great idea to start feeding the birds. They are all busy building nests and really appreciate it when people put out good quality seed to help them feed themselves while they are finding insects to feed their young. Click on the picture to be taken to our website to start recycling. This birdfeeder is really easy to make and will attract some amazing birds to your garden. The best thing about it is the price tag!! £0!! You'll be surprised how easy they are to make and how much money they will save you. 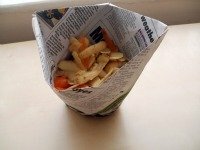 You can even use them to put in your kerb side compost collection as most local authorities allow you to wrap your scraps in newspaper. Please check with them first though. Click on the picture to be taken to our website to try it out.